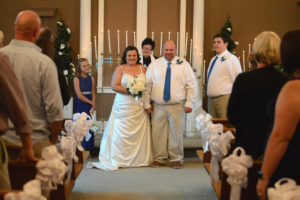 Tiffanie Brooke Putnam, originally of Albermarle, NC, and Charles Ryan West, originally of Wadesboro, NC, were united in marriage in the ivory Chapel at Wedding Chapel by the Sea. The Reverend Pam Muse officiated. Tiffanie is the daughter of Jimmy W. & Jan A. Eudy. Ryan is the son of Debby B. West & the late Charles F. West. Tiffanie’s attendants were the Daughters of the Groom: Reagan N. West & Ella M. West of Albermarle, NC. Ryan’s attendants were the Sons of the Bride: Camden L. Putnam and Aiden J. Putnam of Albermarle, NC. After a honeymoon in Myrtle Beach, SC, Ryan and Tiffanie will make their home in Albermarle, NC. Please join Wedding Chapel by the Sea in wishing the Happy Couple and their family a long and happy life together.